I finally made my first preserved lemons of 2015, one of my new annual pantry traditions. Until last year, I focused on jams and chutneys in my kitchen, but then I remembered my grandmother’s passion for preserving, her huge cellar packed with shelves up to the ceiling. I can still picture the long lined jars of preserved fruits, all those cherries, plums, pears and apples kept in colourful juices, the crop always came straight from her own or her children’s garden. I used to love this room in her old house with the cherry tree in the garden, this was true kitchen magic for my young eyes. In late summer, my family used to have so many fruits that preserving was the only way to prevent waste. Living in the city doesn’t really confront me with this problem, we eat the fruit and vegetables as soon as I buy them or not long after. So unfortunately, there are no baskets full of ripe late summer harvests waiting for me on the kitchen top, but I discovered a couple recipes that are equally satisfying, in preparation and consumption: lemons and artichokes! This year’s preserved lemons are already as tasty as the last batch. I prepared them about 6 weeks ago and they still need a couple months to turn into perfectly tender bites, but I’m impatient and today’s recipe asked for their salty sourness. I made meatless burgers with black Beluga and red lentils. 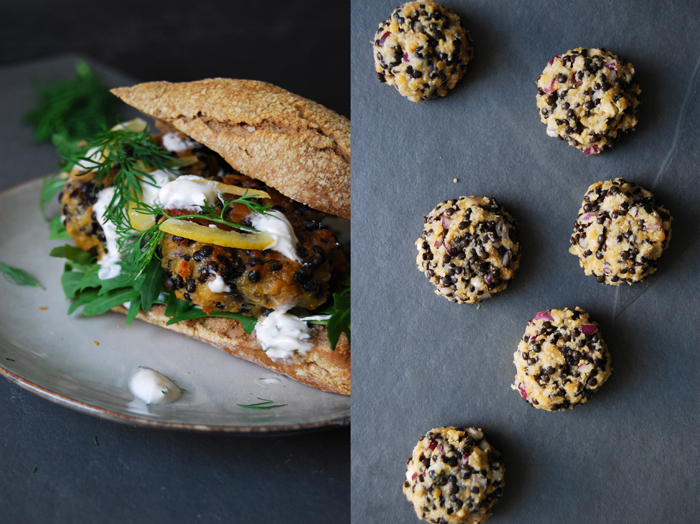 The dark lentils stayed crunchy after I cooked them and the red legumes were quite soft, the perfect burger mixture. I refined them with cardamon, parmesan and red onions, squeezed them in a bun and topped the little beauties with a refreshing dill dip and my fruity lemons – a proper spring burger! 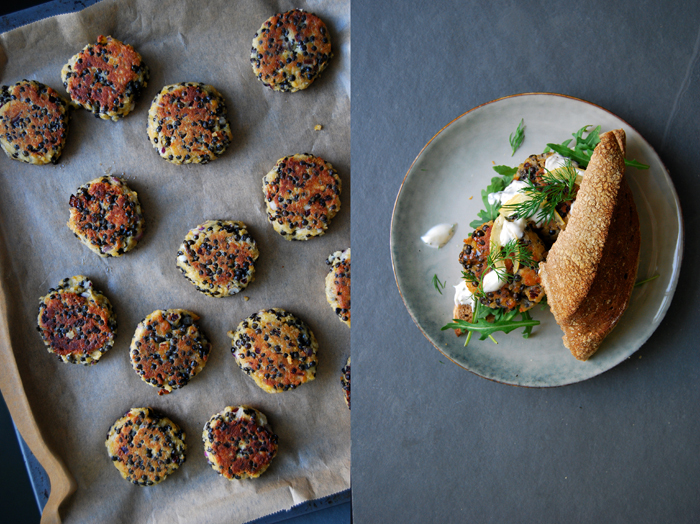 I made 15 lentil patties, for the 2 sandwiches you will only need 4. Cook the red and black lentils separately, according to the instructions on the package, each with 1 bay leaf but without salt. My Beluga needed 20 minutes in 325ml / 11 ounces of water (they should be al dente), the red lentils took 10 minutes in 325ml / 11 ounces of water to be done (they should be soft and mushy). Drain both well once they are cooked and let them cool for about 10 minutes (I cooked mine a few hours before I made the patties). Set the oven to 200°C / 390°F (fan-assisted oven) and line a baking sheet with parchment paper. In a large bowl, gently mix the lentils and the ingredients for the patties with a wooden spoon until well combined. Wet your hands and form 70g / 2 1/2 ounces patties. Heat a generous splash of olive oil in a heavy pan and fry the lentil patties for 2-3 minutes on medium on both sides until golden brown. You will have to fry them in batches. Transfer the patties onto the baking sheet and cook in the oven for 9 minutes. Whip the ingredients for the dill sour cream until creamy and season to taste. 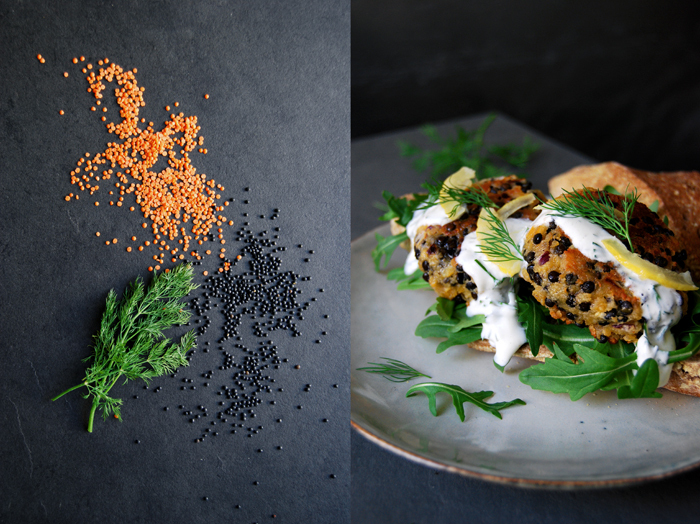 Spread a little rucola on each bottom side of the buns, lay 2 patties on top and drizzle some dill sour cream over the lentil burgers. 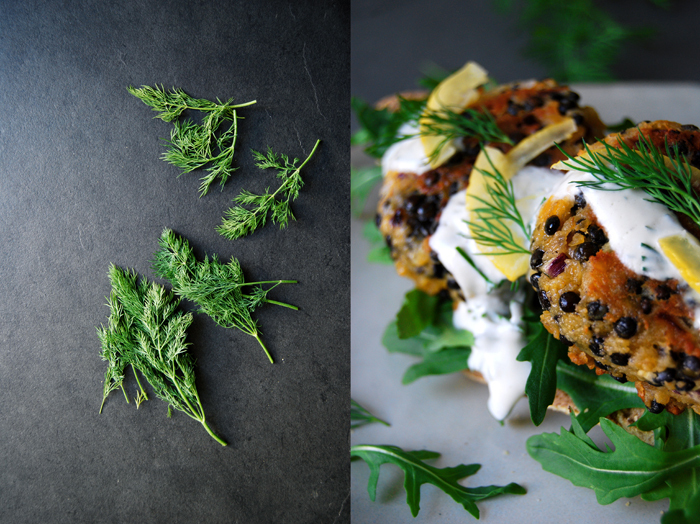 Sprinkle with slices of preserved lemon and fresh dill. Enjoy! the two-lentil play and your addition of parmesan sound yummy. 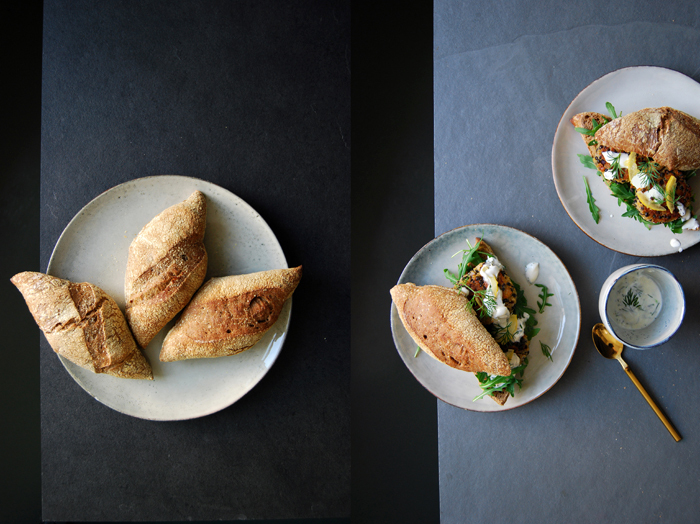 i especially dig how the beluga lentils shout for attention in the photographs. stunning. Wow, these look and sound absolutely delicious! I adore lentils and have seen them around in burgers, but your version takes the cake… or the buns (?) 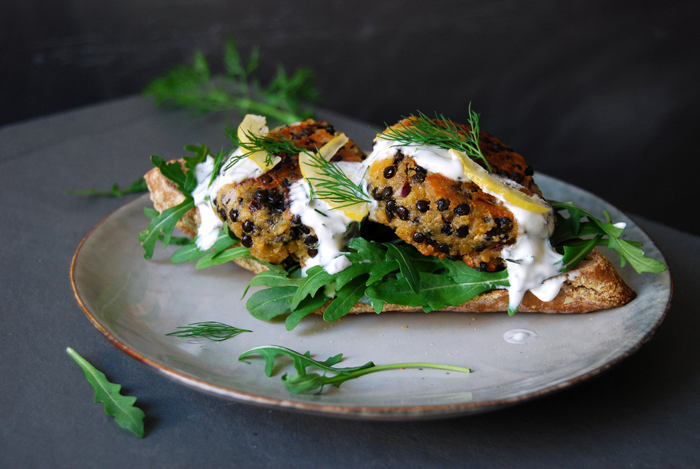 The flavor combination of the cardamom, preserved lemons, and dill just sounds fantastic! Thank you so much for sharing! This recipe sounds and looks great (wonderful pictures again!). I often eat vegetarian and i will try this burger, my daughter will be also excited i think. After reading i took a look at the recipe of the preserved lemons and i really have to make them. I don’t know if you know Cynthia Barcomis recipe of apple chuntey, i made this the second time this year, because all the glases have got legs and went to friends and the family :). It is also with lemons and it is so delicious. So your preserved lemons must be perfekt! Have a nice day and thanks for those tasty pictures.